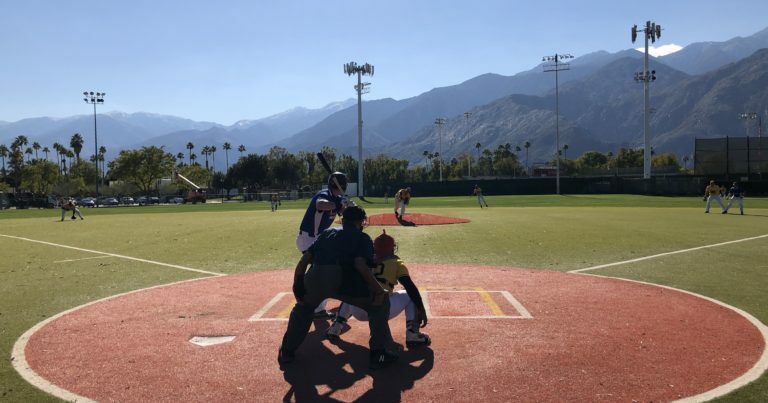 PALM SPRINGS, Calif. ~ The British Columbia Bombers defeated the Washington Blue Sox by a final score of 4-0 during the first game of the day on the auxiliary field. Winning pitcher Cole Edgens carried a perfect game into the fourth inning for the Bombers before allowing a hit to Blue Sox third baseman Masumi Ohira. It was one of only four hits allowed by Edgens on the day, who went the distance while also recording three strikeouts and walking one batter. The Bombers were led on offense by Alex Delacruz-Rodriguez, whose two triples and run helped British Columbia cruise to victory. Elijah Carter added two hits and a run for the Bombers as well, and Kyle Robinson finished his day 2-for-4 with an RBI for British Columbia. Keita Shimuzu suffered the loss for the Washington Blue Sox, pitching three innings and giving up five hits along with three runs. The Toronto Rush beat the Palm Springs Power in the first game at Palm Springs Stadium in a shutout to win 6-0. Winning pitcher for the Rush Larry Brown started off by giving up a base hit to Jordan Matos of the Power, then would sit down the next ten batters in succession before hitting Jacob Boston with a pitch ending the streak. The Rush did damage in the second inning scoring four runs and sending eight batters to the plate. After a quick flyout, Tyler Cowles, T.J. Ward, and Kyle Noel for the Rush hit three consecutive singles setting up a two-run single from Bryson Conner. Kyle Brown took the loss for the Power after going two innings and giving up four runs on five hits. The second contest on the auxiliary field ended in a 0-0 tie between the Oregon Lumberjacks and the New York Colonials. Mark Lynam had the lone hit of the game for the Lumberjacks, finishing 1-for-2 for the day. New York’s starting pitcher Shoji Murayama tossed four innings with four strikeouts and no walks. Oregon used four pitchers who combined to give up only three hits and strike out four batters. Both teams had runners thrown out at home plate while trying to score on singles. Right fielder Charles Sturdivant II for the Lumberjacks and Colonials’ left fielder Jake Luce each showed off their arms to keep the game scoreless. The second game at the stadium was offense heavy as the Canada A’s and the Palm Springs Chill combined for 17 runs with the Chill prevailing 11-6. The Chill would score about half of their runs in the first inning plating six runners on six consecutive walks between pitchers Braydon Gomes, who took the loss, and Bryce Foster. The A’s fought back by scoring two runs in both the third and fourth innings thanks to run scoring base hits from Matt Holliday, Tyler Pfeffer, Bodie Bryan and Hibiki Sunaoshi. Donnie Speranza took home the win going 3 ⅓ innings. For the A’s, Holliday had his best game of the young campaign going 2-for-4 with a double and two RBIs and a run scored. On the Chill side, Andrew Kendrick going 1-for-1 with an RBI double and three walks including an RBI walk in the first inning.